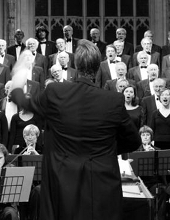 Bath Choral Society (founded 1887) is a lively amateur mixed choir of about 110 voices, engaging professional orchestras and soloists and presenting a wide range of sacred and secular repertoire. The choir performs four or five concerts a year in Bath, including two performances of Messiah in Bath Abbey during early December. Will Dawes has been our Musical Director since September 2011, following in the footsteps of Matthew Bale, who retired that year after 23 happy and productive years with the choir. He has been responsible for the programming of all the concerts since January 2012, including a performance of Monteverdi Vespers, an evening of Haydn The Seasons and a concert including James MacMillan The Seven Last Words from The Cross and Faure Requiem. In 2011 the choir also sang Vaughan Williams A Cambridge Mass with guest conductor Alan Tongue and two acclaimed performances of Messiah with Jeremy Summerly. Encouraging all ages, the choir has been particularly successful in attracting younger singers over the last few years and has in place a bursary scheme for singers under 25 which helps with membership and music costs and also provides complimentary individual singing lessons. Bath Choral Society regularly supports local charities and has recently raised nearly £1,000 for Off the Record. In 2010 and 2008 the choir collaborated with Bath Abbey in concerts to raise money for Water Aid and the homeless in Bath, by performing one of Bach’s Passions as part of the Abbey’s commemoration of Holy Week. Every two years the choir tours abroad and performs varied programmes in some of the great musical cities of Europe. ln the summer of 2013 it will tour to Ghent and Bruges.